When I was a kid a summer salad was not complete without a couple of slices of vinegary preserved beetroot, usually out of a can, bleeding into all the carefully composed ingredients on the plate. Mum’s parents set aside the entire backyard to growing vegetables, including beetroots and I fondly remember Grandma’s homemade intensly sweet version of pickled beets. Fast forward the film thirty, if not forty years, and I discover beets of another dimension. The sweet earthy richness of baked beetroots and the fresh sharpness of shredded raw beet salad are now standard dinner menu items. Be warned this dip is addictive! Wrap the beetroots in aluminium foil and bake in a moderate oven for 1 hour or until soft when pierced with a skewer. Remove from the oven and allow to rest until cool enough to handle. Slip the skins from the beets and chop roughly. In your processor, blitz the garlic clove until finely chopped. Add the beets and process to a puree. Add the yoghurt, salt, pepper and wasabi, blitz to combine. We’re so, so lucky that our world has shrunk and delicious food crosses cultural and territorial borders in the blink of an eye! I think this dip might have it’s roots in Greece. Love everything about the beats (but the cleaning involved after using them…)! This looks awesome! Thanks for sharing the alternate version of my favorite honey cake, sounds like it could work very well! 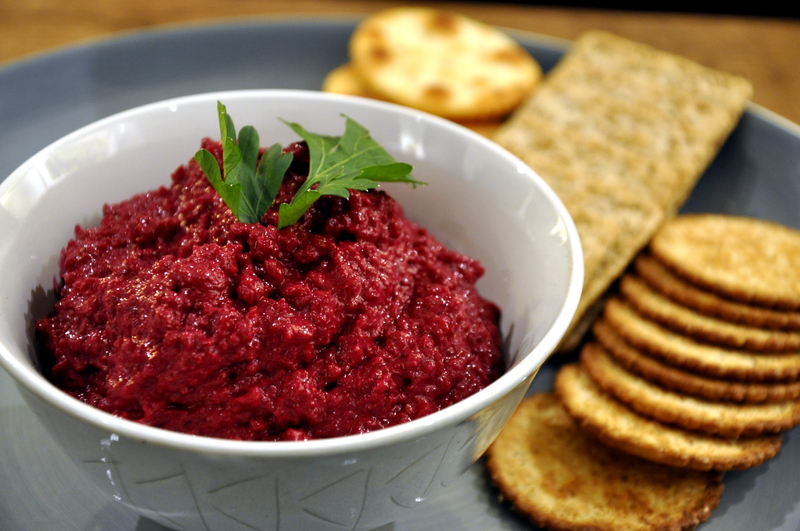 This entry was posted on July 10, 2012 by ladyredspecs in Dips and Spreads, Food, Gluten Free, Light Savoury Dishes, Side Dishes & Salads and tagged beetroot, dip, wasabi, yoghurt.